This article is about the film. For the Beyoncé Knowles and Jay-Z song, see Hollywood (Jay-Z song). 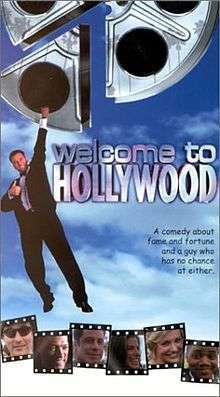 Welcome to Hollywood is a mockumentary about a young man trying to make it in Hollywood as an actor. Tony Markes is the young man trying to pursue the means to become an actor. Various attempts to get him noticed and in roles in film and television fail. When he finally does get a break and gets a guest-spot on Baywatch, it ends with disaster as the actor steps on a stingray and has to be hospitalized. The film has appearances from numerous actors, actresses, producers, models, athletes, and other Hollywood figures.